I don't remember much from the place I was born. It was cramped and dark and we were never played with by humans. I remember Mom and her soft fur, but she was often sick, and very thin. She had hardly any milk for me and my brothers and sisters. I remember many of them dying, and I missed them so. I do remember the day I was taken from Mom. I was so sad and scared, my milk teeth had only just come in, and I really should have been with Mom still, but she was so sick, and the humans kept saying that they wanted money and were sick of the "mess" that my sister and I made. So we were crated up and taken to a strange place. Just the two of us. We huddled together and were scared, still no human hands came to pet us or to love us. So many sights and sounds, and smells!! We are in a store where there are many different animals! Some that squawk! Some that meow! Some that peep! My sister and I are jammed into a small cage, I hear other puppies whine. I see humans looking at me, I like the "little humans", they look like they'd be fun, like they would play with me! All day we are kept in the small cage, sometimes mean people will hit the glass and frighten us, every once in a while we are taken out to be held or shown to humans. Some are gentle, some hurt us, we always hear "AW they are so cute! I want one!" but we never get to go with any. of the cage in the morning, I wondered where they put her? Today, a family came and bought me! Oh happy day!! They are a nice family, they really, really wanted me! They had bought a dish and food and the little girl held me so tenderly in her arms. I love her so much! The mom and dad say what a sweet and good puppy I am! I am named Angel. I love to lick my new humans! The family takes such good care of me, they are loving and tender and sweet. They gently teach me right from wrong, give me good food and lots of "LOVE". I want only to please these wonderful people! I love the little girl and I enjoy running and playing with her. something about my heart... I heard the vet say something about, back yard breeders and my parents not being tested. I didn't know what any of this meant, just that it hurt me to see my family so sad. But they still loved me, and I still loved them very much!!! I am now 6 months old. Where most of the other puppies are robust and rowdy, it hurts me terribly just to move. The pain never lets up. It hurts to run and play with my beloved little girl, and I find it hard to breathe. I keep trying my best to be the strong pup I know I am supposed to be, but it is so hard. It breaks my heart to see the little girl so sad, and to hear her mom and dad talk about, it might now be the time. Several times I have gone to the Veterinarians place. I just wanted to feel the warm sunshine and run, and play and nuzzle with my family. Last night was the worst. Pain has been my constant companion now, it hurts even to get up and get a drink. I try to get up but can only whine in pain. I am taken in the car one last time. Everyone is so sad, and I don't know why. Have I been bad? I try to be good and loving, what have I done wrong? Oh if only this pain would be gone! If only I could soothe the tears of the little girl. I reach out my muzzle to lick her hand, but have to stop because of the pain. The Veterinarian's table is so cold. I am so frightened. My humans hug and love me, they cry into my soft fur. I can feel their love and sadness. I manage to lick their hands softly. Even the vet doesn't seem so scary today. He is gentle and I sense some kind of relief for my pain. The little girl holds me softly and I thank her, for giving me all her love. I feel a soft pinch in my foreleg. The pain is beginning to lift. I am beginning to feel a peace descend upon me. I can now softly lick her hand. My vision is becoming dream like now, and I see my Mother, my brothers and sisters, in a far off green place. They tell me there is no pain there only peace and happiness. I tell the family, good-bye in the only way I know how, a soft wag of my tail and nuzzle of my nose. I had hoped to spend many, many happy years with them, but it was not meant to be. The pain ends now and, I know it will be many years until I see my beloved family again. If only things could have been different. "I am sorry," said the Vet. "Pet shop puppies do not come from ethical breeders. I am so tired of putting so many of these kind of puppies to sleep." 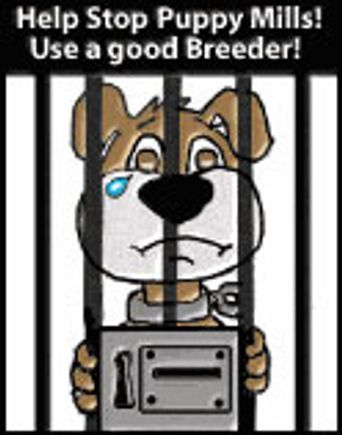 unethical breeders and those who breed only for money and not for the betterment of the breed.